Swift or smooth, broad as the Hudson or narrow enough to scrape your gunwales, every river is a world of its own, unique in pattern and personality. Each mile on a river will take you further from home than a hundred miles on a road. Living in Boulder, you see a lot of creeks and rivers. In June they are raging from all of the snow melt but by this time of year they’ve calmed down a bit and you even see quite a few people out tubing. 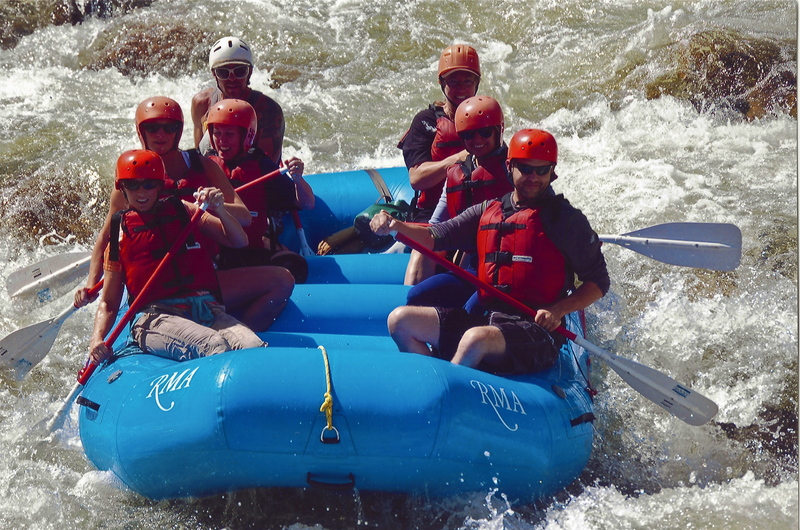 Yesterday my friend Holly and I went on our first Colorado rafting trip down the Cache la Poudre river through Rocky Mountain Adventures. La Poudre was named after French fur trappers who lived in the area and means “stash the (gun)powder”. It’s located northwest of Ft. Collins and we put in at about 5,600 ft. We did the lower half-day trip and it was one of the easier rafting trips I’ve been on, there were a few class 3 rapids. As you can see we’re pretty dry going down this rapid. I’m even smiling for the camera 2nd back on the right. Our guide, Cass, kept us all in the raft, although some of us may have wanted to bail out overboard from time to time from his jokes. Sorry Cass. You were definitely entertaining. I highly recommend Rocky Mountain Adventures. I felt safe and had a great time out there. You are currently reading Cache la Poudre (Pooder) rafting at 52 To Do.